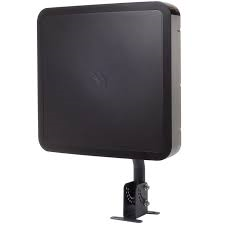 The FlatWave AIR is an antenna designed with ultra low noise split band amplifier that produces a higher quality TV image than most outdoor antennas. The sleek, compact antenna has an integrated amplifier for superior reception allowing little chance of dropouts or pixelation. It can be placed in an attic, a roof, a deck or the side of a home and is easy to install. •Boasts a true dual-path design with separate amplification paths for VHF and UHF that increases signal handling capability and helps eliminate distortion. •Designed and assembled in the U.S.A.
Coax cables and splitter sold separately. Winegard recommends a RG6 coax cable for best performance.